Left: Arjan van Vuuren (also known as “Plastic Soup drinker”). Right: Yassir Bouchnafa (or “destroyer of Microspheres of Toulouse”). 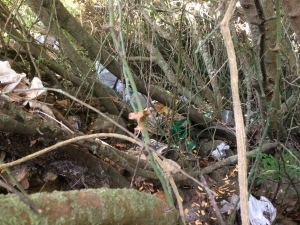 There’s a lot of plastic “hidden” under the vegetation! One hour later, a lot of rubbish and a lot of frustration because there is so much more! What we can tell us about you? Yassir: I come from Toulouse, in southern France. After finishing my studies in Marketing wanted to follow the dream of becoming a stand-up comedian. This project fits perfectly within this objective. Arjan: after studying to be a veterinary assistant, I studied philosophy. In the Netherlands, did comedy videos with my friends. As Yassir, I was on a course that naturally brought me to A ROCHA. What brought you to A ROCHA Portugal? Arjan: I think Caesar said: “I came, I saw, and then stayed for a year to do some things”. I don’t know what he meant. But we’re here to do a project on microplastics were for A ROCHA. Yassir: King Solomon said that “all rivers run to the sea; but the sea is not full “, but if we don’t do something about the microplastics very soon the sea will be full of them. So, are you here to solve the microplastics problem? Yassir: How Spider-man once said: “With great power comes great responsibility”. Unfortunately, we don’t have great power but we have a great responsibility. Our job is to investigate the amount of accumulated microplastics on the beaches of the region. In addition we want to inform people about the microplastics problem. Arjan: at this time, scientists around the world are trying to find out the extent to which the microplastics are polluting our oceans and what the damage to animals, plants and humans. We also want to participate, by collecting data on Ria de Alvor. The plastic that we sent to the oceans is coming back to us in small particles, entering our food and drinking water. As Courtney Love once said: “I don’t need plastic in my body to validate me as a woman.”… Neither do I! In addition to the collection of information and data on pollution by microplastics, you are doing something about plastic waste? Arjan: in early June, we went along with Ruben-another volunteer, to the parking area in the central area of the Alvor estuary. We were too early because the climate in Portugal is … inclement. We took with us 10 big rubbish bags. In just over 1 hour, all the bags were full and, honestly, we all felt a little frustrated. 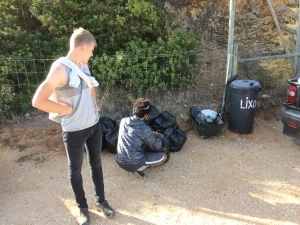 Yassir: We collected plastic bags, bottles, packaging, pieces of candy packaging, fishing equipment, synthetic ropes, styrofoam, buckets, cigarette butts, salt containers, a TV box cover, buckets of paint and batteries. The 10 bags and our six hands were few and looked ridiculous; our efforts hardly took in the garbage found in the parking lot. But responsibility brings us to compromise and so we will continue next week. We expect to see many migratory birds here in the autumn; we would like to welcome them in this beautiful place with as little plastic as possible. 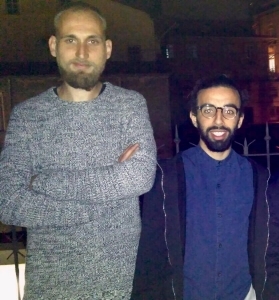 The arrival of these two volunteers is the result of a project funded by the European Union under the programme Youth in Action | Erasmus +, Convention No. 2016-3-PT02-KA105-003893.